What is included in our Local Moving Service? • Moving pads: our staff will wrap your furniture items in specially designed furniture pads to protect your items during the move. We will provide you with a no-cost, no-obligation consultation for your local move and a free estimate of cost to accommodate your move. If you have a very small amount of items to move, a simple over-the-phone consultation may suffice to provide you with an accurate estimate of costs. In the case of a full household move, it will be necessary for one of our moving consultants to visit you personally at your home to do a visual survey of the items you have to move in order give you an accurate estimate of cost, which you will receive in written form. We strongly suggest that you confirm your move with our office at least three weeks prior to your moving day. We are able to accommodate moves with less notice but our schedule is set on a first come first serve basis and some days fill up faster than other. At the time you confirm your move it is best for us to get your new home address along with contact phone number incase we need to contact you. You may choose to do your own packing of items into boxes. (see our Packing Info section) We have a full selection of professional-standard packing boxes, paper and tape if you do not have proper boxes and materials of your own. You can come in to our office and buy them at the counter or we can deliver an estimated amount right to your home, in which case the cost will be added to your final bill. You may also choose to have our professional staff do a partial pack (i.e. dishes, other breakables, lamps, electronics, pictures, mirrors etc.) or a full pack of items into boxes as a part of your move, in which case, a packing team would arrive at your home the day previous to your move day to do the necessary packing and preparation. Charges for packing are on a per carton basis. You may choose to unpack yourself when the move is completed or you have the option of having our staff unpack for you which, in most cases, would be arranged for the day after your move, depending on whether you choose a partial or a full unpack. Unpacking charges are calculated on a time-of-involvement basis. On the day of your move, our moving team will arrive at your residence to commence loading. Our team consists of the Van Foreman who is responsible for oversight of your move, loading of your items onto our truck, and unloading them from our truck at your new residence. With the Van Foreman will be 1-3 helpers (depending on the size of your move) who are responsible for assisting the Van Foreman to load and unload our truck with your items, safely and professionally. Upon arrival, the Van Foreman and helper(s) will ask you to show them the complete amount of items to be moved in a visual survey of your residence and will ask any pertinent questions of you or answer any such questions you may have of them. They will then proceed to lay down rubberized floor runners to protect your floors and carpets, pad any railings on stairways, plastic stretch-wrap any upholstered items you have to move, wrap your mattresses and box springs in plastic, fitted covers and do any other necessary preparations (disassembly etc.) in order to safely and professionally begin your move. As our moving team moves your items into the truck we will pad wrap your furniture items to protect them during transit. Some items are padded in your residence but a majority of your items will be padded inside the truck by your Van Foreman. When loading is complete, the Van Foreman will do a final survey with you through your old residence to be certain no items have been missed. The moving team will then proceed to your new residence (either that same day or the following day depending on the size and conditions of your move) and will repeat the above process of surveying the residence, asking and answering any questions, laying floor runners and padding any railings on stairways. 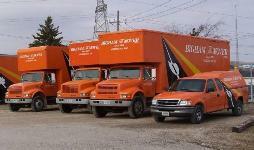 The moving team is responsible for reassembling any items that they disassembled (i.e. beds, table (legs), dresser mirrors, hutch tops etc.) and making sure that you are fully satisfied that all items have been placed where you desire them, in proper rooms and locations. When you are fully satisfied that the above responsibilities have been met, the Van Foreman will calculate charges for the service provided. Local moves are charged on a per hour basis and are adjusted to the actual amount of time involved. Cash, cheque, or charge card (Visa, MasterCard) are acceptable methods of payment upon completion of your move. You may pay the Van Foreman or, if previously arranged, you may come in to our office to pay or have us phone in your charge card number for authorization to pay by credit. If you have done your own packing and have purchased boxes from us, then we will gladly return, free of charge, to pick them up at a convenient time when you have had a chance to unpack most or all of them. Simply call our office when you are ready for us to come and we will arrange to do this for you at the nearest convenient time. If you choose to return them to our office, you will receive a 30% rebate on the number of boxes returned. If you have had our staff pack for you, then we will unpack as arranged and remove all boxes from your residence at that time unless you have chosen to do the unpacking yourself, in which case the above description applies.